Super Burn Slim (3-10 kgs per month) dietary supplement from Beauty Korea. Has been tested by Halal, GMP. Weight loss supplement. Imported from Switzerland extensive programs reduces tummy, hips, thighs, cellulite and breaks up fat metabolism by as much as six components of the extract concentration. Traps all kinds of fat. The fat goes out with a bowel movement and helps the digestive system work better due to the high fiber diet. Slimming Diet products are imported from Korea by PB Pretty White Co., Ltd.
Slimming Diet is a dietary supplement to lose weight for resistance reduction is the real 5 kilo slim. Slimming Diet products accelerate fat metabolism, reduce fat, reduce weight. Antioxidant proportional fitting shape. Instant slimming. Free from side effects. Accelerates the burning of fat over 20 times the antioxidant, tight fit body shape. Removes excess fat. Harmless because it is natural. Take 1-2 capsules before breakfast and again before meal 15-30 minutes 1-2 times daily . Although an extremely effective diet pill, because all the ingredients within Slimming Diet are completely natural and do not drastically alter any body processes, this product has not been associated with any negative side effects. Some individuals may experience slight headache or nausea for the first few days of taking the pill as their bodies become used to the formula, but these symptoms tend to disappear within a few days. However, if any adverse reactions are experienced, discontinue use immediately and consult your health care provider. Additionally, women who are pregnant or breast feeding should not take Slimming Diet. Slimming Diet contains clinically proven ingredients to burn more fat, eat less food and lose weight fast! Keep away from children and sunlight. • High blood pressure. Stroke. • heart disease, irregular heartbeat. • Depression, psychotropic medication use. • Epilepsy, glaucoma, prostate disease. 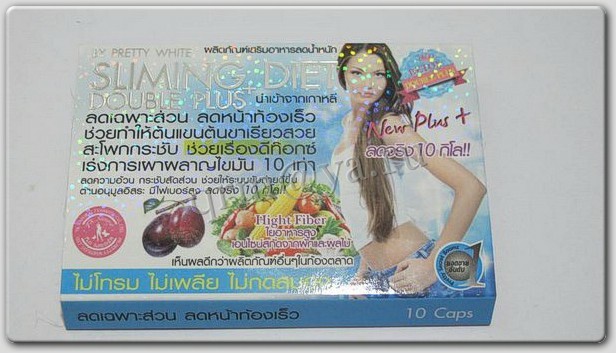 Click the button below to add the "Sliming Diet Double Plus" slimming capsules to your wish list.